Snow mold can be a real problem in Ohio after a long winter with a snow blanket covering the lawn for a majority of time. We'll take a look at what causes this problem, and how you can fix it. Snow mold is an actual mold that grows in your lawn due to the lack of sunlight and airflow caused by a heavy blanket of snow over your lawn for a long period of time. Even though it looks terrible, most snow mold cases do not need any treatments to fix it. Similar to mold in a damp area, the key to ridding snow mold is sunshine and air reaching it. 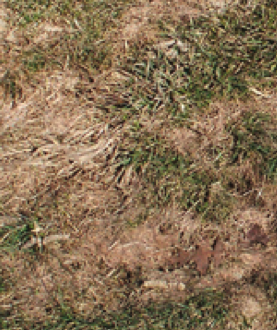 Identify the Areas of Snow Mold: These areas are often "matted" areas with a "crusty appearance. Mow Away or Take a Blower to the Crusty Areas: Wait until the grass grows a bit, and simply mow the affected areas to remove the "crusty" parts. Oxygen Will Begin to Kill the Mold: The mold will begin to die as oxygen hits the area. Lightly Rake the Areas (This Should Be a Last Resort): Take a leaf rake and lightly rake these areas, breaking the crust and "fluffing" up the grass in these locations. Be Careful Not To Rake Too Hard: Do not rake too hard, as this can damage the crown of the plant. What Should I Do if it Persists? If after 1-2 weeks of warmer, sunny weather, and after mowing the area, you still see the mold; call us to come out and diagnose the problem.